China and Norway signed an array of cooperative agreements including trade, sports exchanges and research innovation on Tuesday as the two countries pledged to develop a pragmatic partnership. President Xi Jinping and visiting King Harald V of Norway witnessed the signing of the agreements after talks at the Great Hall of the People in Beijing. A welcoming ceremony was held before the talks. The two leaders agreed to make joint efforts to inject fresh vitality into the development of relations and write a new chapter in the traditional friendship between the two countries. Speaking to King Harald, Xi said advancing the sustained, sound and stable development of SinoNorwegian relations conforms to the interests of the two peoples and the trends of peaceful development and winwin cooperation. The two sides should continue to enhance political mutual trust and fully respect each other's core interests and major concerns to lay a solid political foundation for their ties, Xi said. Xi called for pragmatic cooperation in various fields, saying China is ready to talk to Norway about cooperation under the Belt and Road Initiative framework. They should work together to push for economic globalization, multipolarity, multilateralism and sustainable growth in international affairs, he added. Xi welcomed Norway to share experiences with China in winter sports and help in its preparation for the Winter Olympics in 2022. He said China is willing to develop exchanges and cooperation with Norway within the framework of Arctic Council. 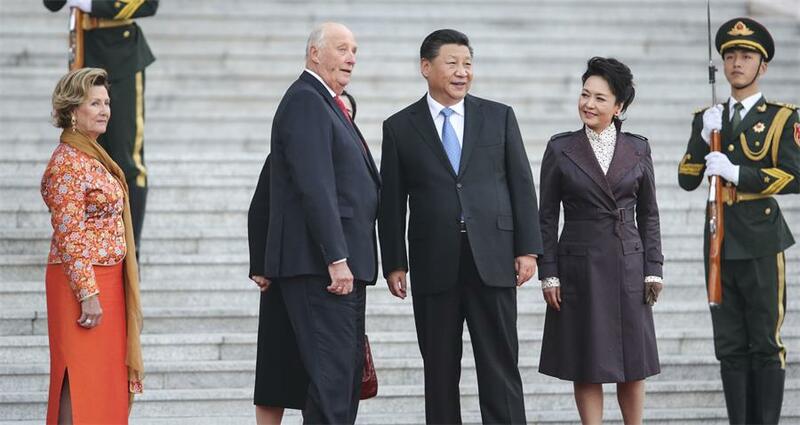 This is the first state visit of King Harald and Queen Sonja to China since the two countries normalized their diplomatic ties in December 2016. The couple have visited China multiple times, the first being in 1985. Accompanying them on the visit is a Norwegian business delegation of around 340 people representing 140 companies — the largest business delegation ever from Norway to China, according to the Norwegian embassy. King Harald said his visit indicates that the nations' ties have gotten back on the right track and are displaying strong vitality. There is great potential for them to develop cooperation, he added. China is the largest trade partner of Norway in Asia with bilateral trade reaching $5.62 billion last year. The two countries are negotiating a free trade agreement. Zhou Hong, a senior researcher of European studies of the Chinese Academy of Social Sciences, said China and Norway have common positions in international affairs such as climate change and the Iran nuclear issue, and the royal visit is a positive sign in the country's development of ties with China.